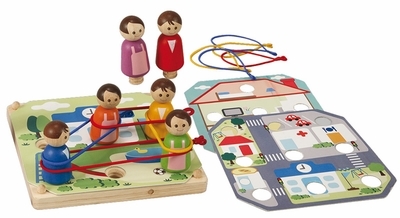 Plan Toys 5163 - There are 3 pattern cards( School, Community, and Home), 6 figures, 9 elastic bands and a wooden board. The six wooden figures screw into the wooden play board. Children can create their own pattern or follow the pattern cards. Pick a colorful elastic band and connect Mom to Dad or hospital to school. Game board measures 6.9" x 6.9" x 0.5". Made from rubber wood and printed with non-toxic soy ink.